Need Flat Rolled, Cold Rolled, or Hot Rolled Steel? Grand Steel is a Proven, Trusted Supplier! When it comes to sourcing the flat rolled, cold rolled, and hot rolled steel that your operation needs to maintain pace, you can trust Grand Steel to deliver. As a full-line steel service center, we’ve earned a reputation for the quality of our products, the helpfulness of our support staff and, our unerring ability to meet strict deadlines. Constantly working to improve our customers’ experiences, we’re continually expanding, adding things like in-depth laboratory testing, additional delivery trucks, and upgraded equipment. With a wide range of products available in the dimensions that you need, you can absolutely count on us to meet – and exceed – your application’s requirements. In today’s post, we’re going to look at a few of the benefits of sourcing your flat rolled steel products from us. With our own in-house testing and a commitment to upholding the highest quality control standards in the industry, we know that our customers have no need – or use – for inferior products. We utilize our own fleet of trucks that are able to deliver our products to our customers in a timely, dependable manner. From cold rolled to hot rolled steel, we’re dedicated to ensuring that our clients receive the products they need on time, every time. Grand Steel understands that the best products are produced using the best equipment. Continually seeking to improve, our 50,000 square foot facility is filled with the industry’s most reliable – and most accurate – equipment. 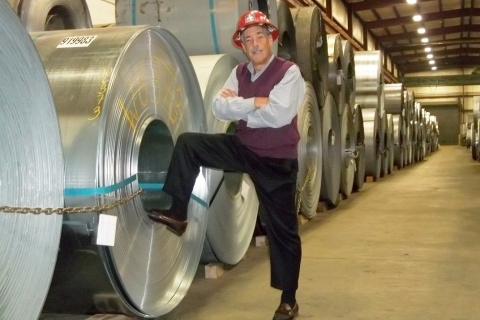 At Grand Steel, we understand that our clients need the best steel products available. With a team of highly trained operators and the industry’s best equipment, you can trust us to deliver the products that you need. If you’ve been searching for a full-line steel service center that will rise to the challenges of your operation, contact us today to learn how we can help.